As Europeans in Canada, we sometimes miss the easy access to mainland Europe we enjoyed whilst billeted in the UK, and the ease with which we could visit cities like Paris or Bordeaux at the drop of a stylistic hat. But we shouldn't worry: as committed Francophiles, we've just learned we can enjoy authentic French flair just ninety minutes from our base in Toronto. Quelle surprise! Last week, to this end, we spent several days in Quebec City, a destination that -- after ten years in Canada -- we still hadn't visited. Ah, Quebec. 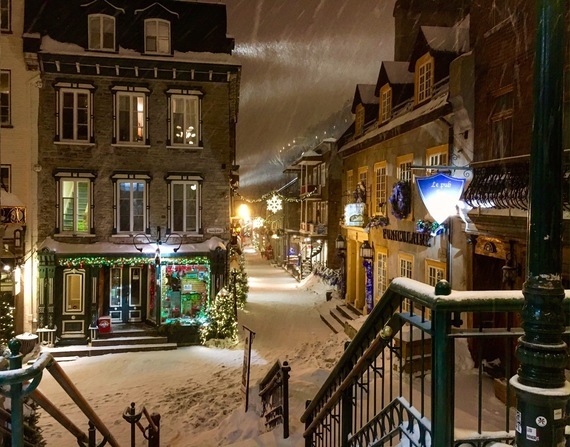 Historic, beautiful Quebec. And getting there couldn't have been easier: we literally walked to the airport from our downtown Toronto condo (tugging our wheely bags behind us took all of ten minutes) to Billy Bishop where we jumped aboard a Porter Air flight that felt for all the world like business travel even though the carriers pricing is set at one class. Founded in 1608 by French explorer Samuel De Champlain, Quebec City is the veritable cradle of French civilization in North America. Popular with design aficionados, history buffs and architecture fans, it boasts a plethora of boutique hotels although, on recommendation from friends, we booked The Auberge Saint Antoine. Nestled in the city's Old Port, opposite the St Lawrence River, it's a luxurious retreat with an aesthetic that fuses new build and lovingly restored ancient construction. Prior to being a hotel, the property was used as a wharf, later a cannon battery and then by British merchants when Québec City was one of North America's biggest ports. Now re versioned, the outpost is spectacular. Bedrooms are luxuriosly appointed, there's an awesome cocktail bar and Panache, a post and beam vaulted ceiling restaurant. Widening our net to capture further inspiration, we booked dinner at Fairmont Le Chateau Frontenac, a grand hotel built in the 1890's for The Canadian Pacific Railway Company. 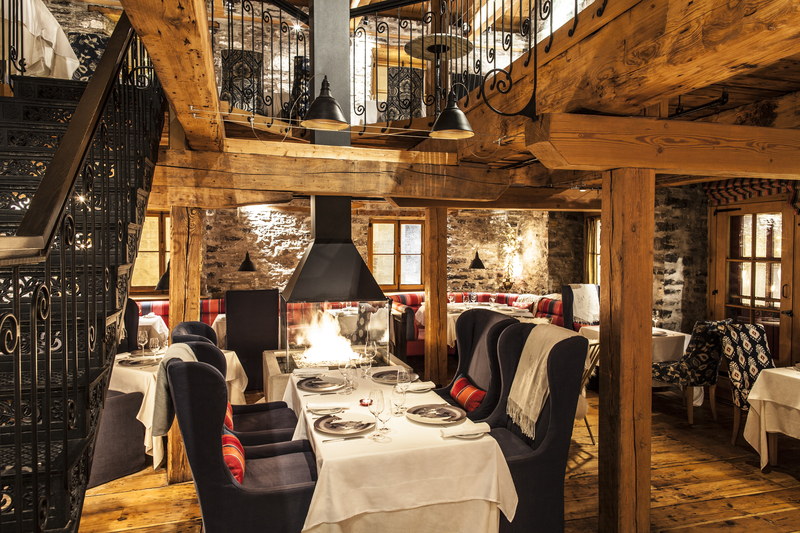 The subject of a recent $75m refurb', the Chateau (voted, by Conde Nast Traveller, amongst the world's Top Ten Most Iconic Hotels) more than retains its Quebecois heritage. Dining at Le Sam, and overlooking the ice crusted St Lawrence River, we enjoyed a Jurassic scaled charcuterie board and the pinkest, plumpest lamb chops ever. 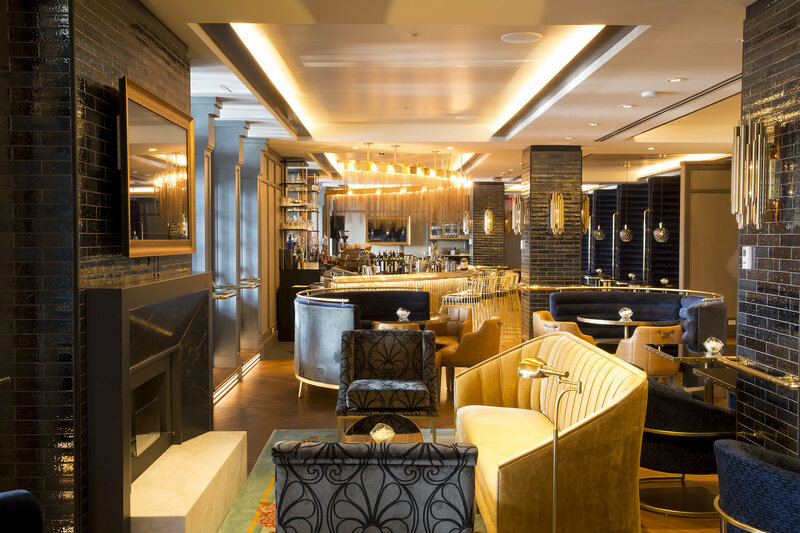 The eatery's interior is a dramatic fusion of black and cream, richly accented with shots of gold and stone finishes. Visit Fairmont Le Chateau Frontenac to see more. We fully expect to infuse future C&J schemes with whispers of the elegant environment. It's fair to report we fell in love with Vieux Quebec and its UNESCO World Heritage site fortified walls. At every opportunity we pounded the cobbled streets, tempting cafes and boutiques, somewhat blindsided by the old town's architectural beauty and at all times reminded of our formative years in Europe. 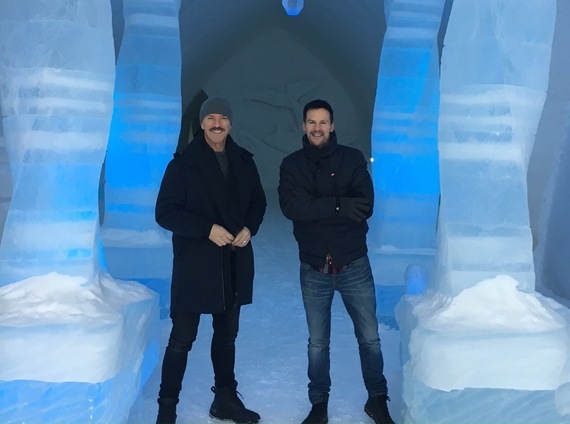 With an afternoon spare, we made the short half hour drive to Quebec's famous Hotel De Glace, a magical crystal white frozen palace which is currently entering its 17th (short but frigid) season. Find out more at http://www.hoteldeglace-canada.com and prepare for polar orbit at The Valcartier Vacation Village structure that's as much art installation as it is a cool (if you'll excuse the pun) destination. 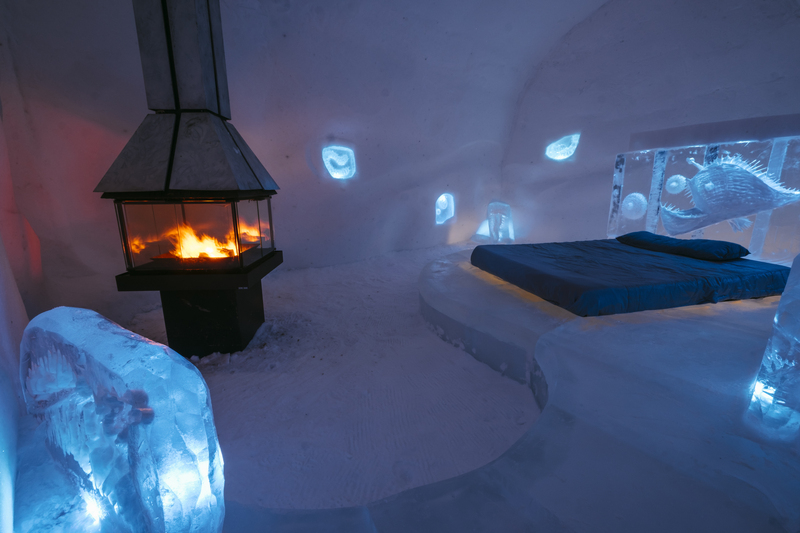 But come on: a hotel made from ice? Yes. But re building it, annually, is no mean feat. Each year's frozen fantasy depends upon sub-zero temperatures during construction and operation. All walls and fittings are made of ice and compacted snow, held together using 'snice', a medium that takes the place of mortar in traditional brick-built structures. 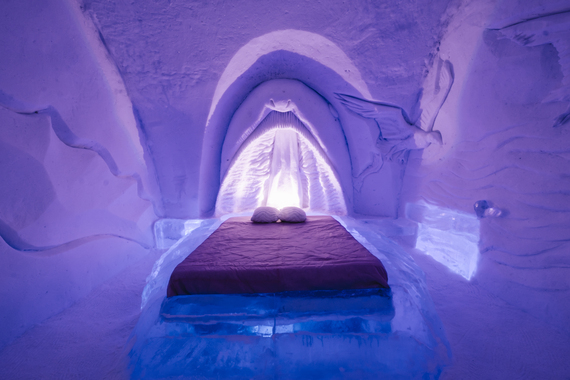 It takes fifty people six weeks to build, using approximately thirty thousand tons of snow and five hundred tons of ice. 'Northern Perspectives' is this year's theme. Cue hand sculpted 3D friezes depicting polar owls, whales and dolphins and an eerie silence due to walls that are up to four feet deep. 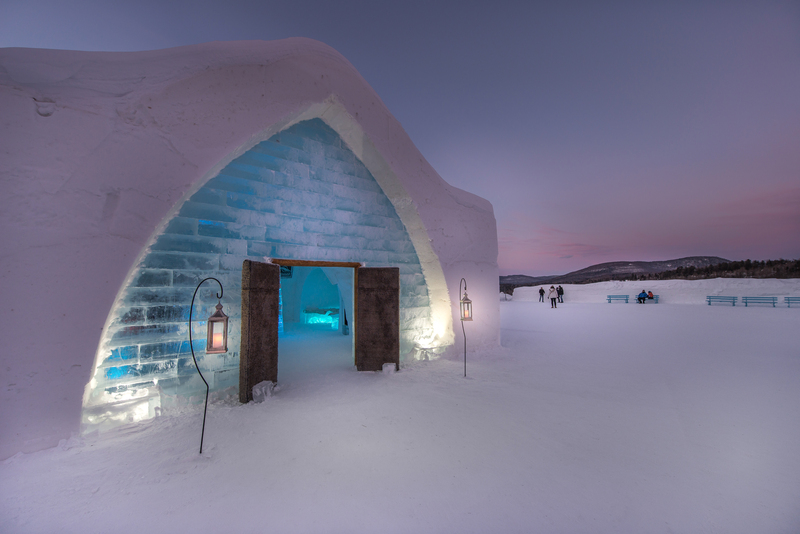 With its scintillating carved ice chandeliers, vast frozen hallways and ever-popular Ice Bar (which serves cocktails in sparkling ice vessels) the hotel is mesmerizing. In total there are forty-four themed rooms and suites and even a chapel. It truly is an exercise in aesthetics, a world where frozen beauty meets hot urban style. Can we say awe inspiring? Can we say jaw dropping? The avoidance of hyperbole, to be honest, is tricky being that the destination is so undeniably spellbinding. All beds are made of ice, but worry not -- they're dressed with mattresses. As night beckons, sleeping bags and pillows are delivered to enhance comfort. Some bedrooms, incredibly, have roaring fires (contained in glass hearths) but these are designed to dispatch heat through chimneys rather than amplify ambient temperatures. Only minimal warmth emanates -- they're more aesthetic -- but boy, are they atmospheric. So visit while you can: ephemeral magic like this doesn't last forever. On the 26th of March, before the fairy-tale melts due to climatic shift, the entire structure will be safely dismantled in just a few short days. And the planning for next year's architectural butterfly will begin in chilly earnest.